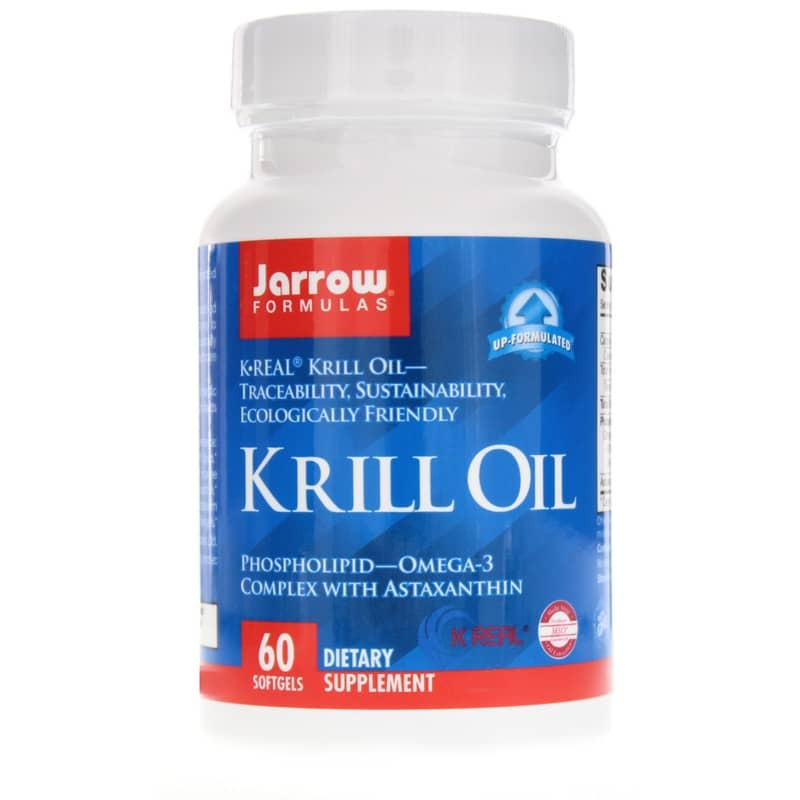 Jarrow Formulas' Krill Oil provides a low temperature extract of Antarctic krill, along with phospholipids rich in omega-3s, to support fat management and brain health. A shrimp-like marine animal, Krill serve as the primary food for fish and marine mammals. 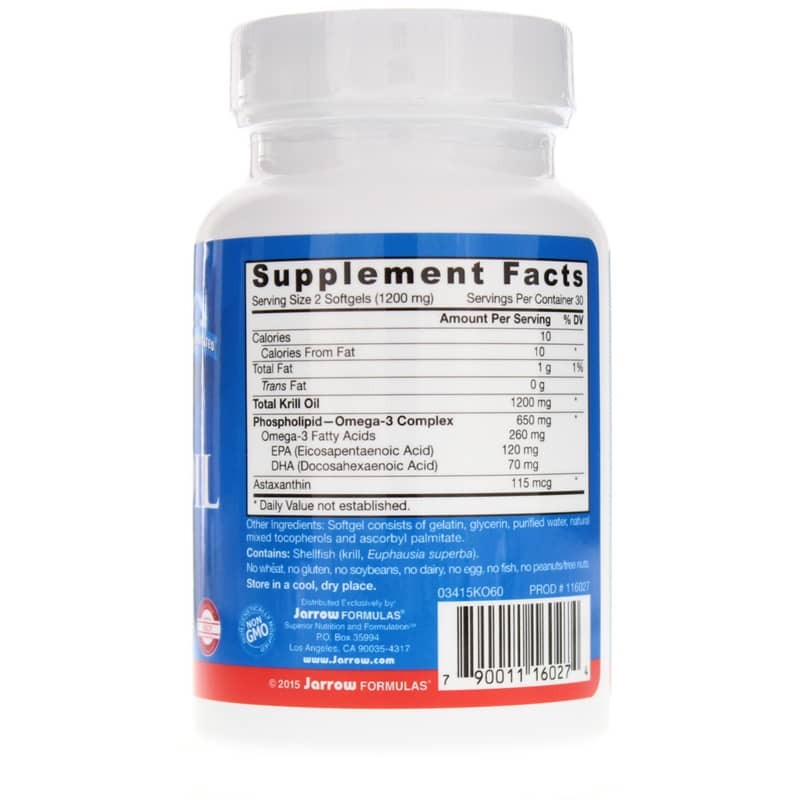 Oil extracted from krill is rich in omega-3 essential fatty acids and chemical substances known as phospholipids that increase the absorption of omega-3 in your body. Found in especially high concentration in your brain cells, phospholipids are critical cell components and are involved in oxygen transportation. Meanwhile, omega-3s EPA and DHA may help support heart health and lower triglycerides, or fats in your bloodstream. Omega-3 fatty acids may also play a critical role in reducing pain and swelling throughout your body, including your blood vessels and joints. To use as a dietary supplement, take two softgels a day with a meal, or as directed by your qualified health care consultant. Other Ingredients: Softgel consists of gelatin, glycerin, purified water, natural mixed tocopherols and ascorbyl palmitate. Contains NO: GMOs, no wheat, no gluten, no soybeans, no dairy, no egg, no fish, no peanuts/tree nuts. Superba is a trademark of Aker Group. 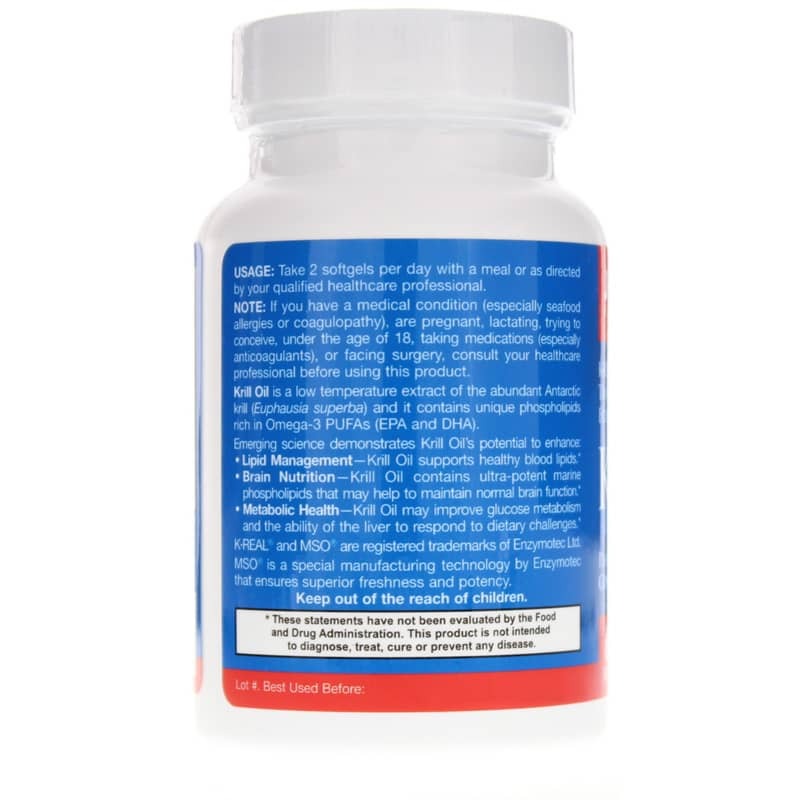 Adults: Take 2 softgels per day with a meal or as directed by your qualified health care consultant. If you have a medical condition (especially seafood allergies or coagulopathy), are pregnant, lactating, trying to conceive, under the age of 18, taking medications (especially anticoagulants), or facing surgery, consult your healthcare practitioner before using this product. Keep out of the reach of children. The value of krill oil is well-documented. Jarrow is usually a good "bang for your buck" priced product.